Michelle Campbell and I presented at CONNECT 2018 in Niagara Falls this week. After some very encouraging conversations at Treasure Mountain Canada in October, we decided to take our ideas about the intersection of school libraries and eLearning success to the wider audience at this conference. CanConnect attracts some of the greatest education influencers in the province, if not the country and has the power to implement our ideas and philosophy nationwide. Each of the buttons on the secondary portal lead to a drop down menu containing appropriate digital resources in each. We have both sponsored and subscribed digital resources here. The invention of UG2Go was a game-changer for me as a teacher-librarian because I could direct staff and students to one place for everything. Do you remember when we were kids that there were these Block Parent signs around the neighbourhood? Block Parent meant that you could go to that house for help for whatever reason. School libraries are like the Block Parents in schools. No matter if you need academic help, tech assistance or just want a place to be yourself, you can find this place in a school library. The shift to learning commons means that school library staff now aim to have this same safe experience in all of our resources: physical and virtual. In UGDSB, the addition of robust digital resources has made it even more attractive to all students, but especially to students who break the mould. Many of our students come to the school library learning commons well before and after school and on no bus days just for our hospitality and wifi. The library is not a quiet library anymore as learning takes on many forms. The library learning commons is also safe for creative risk-taking in learning. So why, when we were first rolling out eLearning courses, didn’t the school library come to mind? Why are we an after-thought now that the stakeholders realize that many of the students taking eLearning require some face-to-face help to be successful? I hate to be repetitive but this is largely because the education system bought into the digital native myth, leading everyone to believe that new generations of children would innately be comfortable using digital technology for all of their tasks. What we’ve learned from decades of mediocre success rates is that students need equitable access to technology and technology instruction needs to be explicit and in context of learning. Students need to learn how to learn and that above all, digital technology is an additional layer to this learning not an innate process. Even now, boards are eliminating teacher-librarians and technician jobs and instead creating unstaffed learning commons and e-learning hubs. Much of what I do day-to-day involves personal coaching of staff and students in designing and implementing deep learning tasks both online and offline. I provide technology, professional development, just-in-time support and continuity across the school. Why shouldn’t our eLearning teachers and students have the same support? Face-to-face I am able to create a safe, participatory learning environment where we tailor our daily work to the individualized needs of staff and students. Online I’m still challenged to find a way to embed my library work in online spaces. New developments in collaborative technology and a shift in philosophy to include school support staff would go a long way to improve success rates in eLearning students. The UGDSB hosts its educators and leadership team at a 30 hour conference filled with keynotes, colleague workshops and of course, networking! This year the theme is to ignite our innovation in education. Here is the full story told in the tweets of the conference. 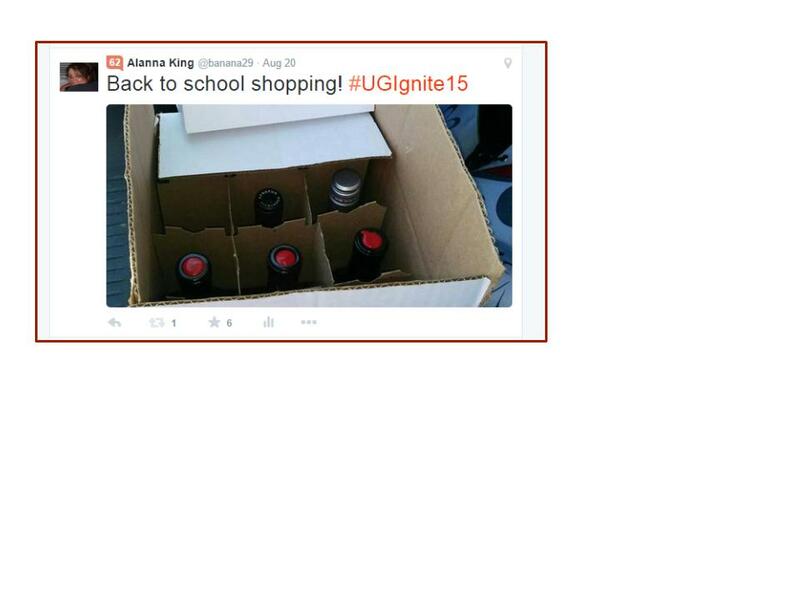 …and here is the tweet that the keynote speaker used in his presentation. How embarrassing! It isn’t the first time that my sense of humour has gotten me in trouble. This week I’ve been attending the Connect conference in Niagara Falls for the first time and as a representative of the Ontario School Library Association Council. It also gives me a chance to speak about my M.Ed. capping paper on how teacher-librarians are in the ideal position to facilitate transliteracy. I mean, we really do have a very unique perspective….and we are generally non-threatening (unless I’m tired and hungry). If you don’t have a teacher-librarian in your school, I hope you have someone who is working tirelessly to integrate pedagogy with cross-curricular happenings. Is it possible to be proactive when technology and the use of social media sites changes so quickly? For those of you still trying to wrap your head around the meteoric rise of social networking over the past decade, this post might hurt a little bit. Because just as you and most of the world were getting a handle on it, the decade of social abruptly ended. I don’t mean that we will stop using Facebook, Twitter, YouTube and Flickr to share with our friends, colleagues and families. In fact, quite the opposite is true, our combined usage of these social networks will continue to increase. Rather, the decade of constructing the social layer is complete. The frameworks that we’ll use to share socially are built, defined and controlled. Construction on the social layer ended with the launch of Facebook’s Open Graph protocols over the last several months. All the interesting social stuff that will occur over the next decade (and there’ll be lots, I’m sure), will exist within this predefined framework built and controlled by Facebook. In short, the decade of social is over. What’s taking its place? The decade of games. Now is our time as parents and educators to take a stand against inappropriate behaviour and to demand that the privacy of each person remains with that person. If I ask you not to take a picture, you stop. (In my case, I don’t allow any pictures of my double-chin or with a drink in my hand to be posted.) If I ask you to remove a picture, you stop. At the same time, we know that this instant fame is also affecting behaviour in a positive way. Remember the Vancouver riots and the consequences for these young people? With the plateauing of social networks, our school boards, our unions, and the law need to negotiate some very strict cultural and legal guidelines to protect us. To not take this crucial step, leaves us, as I said earlier, unprepared for the consequences of social networking. Throughout danah boyd’s “It’s Complicated: the social lives of networked teens”, I’m very satisfied with the level of sophistication of boyd’s research and unbiased point of view in her writing. Her tone is academic, professional and at the same time, approachable. The three areas that most concerned me during my reading are boyd’s research on the digital divide, online teen behaviour of sexual exploration and her plea for the redefinition of crimes associated with online bullying. Yet, talk of “digital natives” may also mask the different degrees access to and comfort with emerging technologies experienced by different youth. Talk of digital natives may make it harder for us to pay attention to the digital divide in terms of who has access to different technical platforms and the participation gap in terms of who has access to certain skills and competencies or for that matter, certain cultural experiences and social identities” (2007). This paragraph amplifies my own worries that this simple term has excused the education system’s lack of action in lessening the digital divide. I’m certain that we still promote the use of technology in the classroom as a tool of engagement, rather than seeing becoming proficient with technology as a fundamental requirement for graduation. Talking about digital natives also tends to make these changes all about digital media rather than encouraging us to think about the full range of media platforms which shape the world around us or for that matter, the complex set of relationships between old and new media that characterize convergence culture. A large part of the digital divide that I know teachers are having trouble improving is the use of networked communities to help students. In many ways administration fears of privacy and legalities have closed the networks for their possible misuses, meanwhile eliminating all possible positive ones. Although I have concerns for all of our students, I have a particular worry about the LGBTQ population that are getting their information from unreliable sources when they desperately need support as they renegotiate social spaces. The anecdotes from boyd’s research reassured me that LGBTQ teens are finding each other online and developing supportive communities. However, boyd warns that “They are grappling with battles that adults face, but they are doing so while under constant surveillance and without a firm grasp of who they are. In short, they’re navigating one heck of a cultural labyrinth” (p. 53). I wish that the education system could find or create places, possibly in tandem with social support structures, where teens could create networks to reliable information. I wish there was a way we could better support this. I’m not sure what the answer is. The digital divide is not just between economic classes and about developing transliteracy skills. Boyd has revealed that the digital divide also includes how living and working as educators in this era of social networking we are not prepared for the consequences of these networks; and we are currently unable to model how to use social networks effectively. boyd, D. (2014). It’s Complicated: The social lives of networked teens. New Haven, MA: Yale University Press. Prensky, M. (2005/2006). Listen to the natives. Educational Leadership, 63(4). When Nicholas Carr wrote the infamous article “Is Google Making Us Stupid?” (2008), he made waves in the education community who had bought into the Marc Prensky vision of today’s students as “digital natives” (2005). While making impetuous decisions about technology integration in schools, Carr halted everyone into thinking maybe we should be a bit more skeptical about technology’s long term effects on the brain. Essentially, Carr asks if our depth of thinking has been doomed to ‘the shallows’ with the advancement of digital technology. He cautions that society has lots of breadth in the sources we have available to us to skim and scan, but that we are losing our ability to read deeply. Using himself as a research subject, he argues that his behaviour in reading digital material appeals to his need for instant gratification, but has caused to become more easily distracted and more susceptible to the control of information corporations. I really appreciate how Carr maps out in history how the very nature of reading has changed with advances in technology. Carr (2011) says: “it is our intellectual technologies that have the greatest and most lasting power over what and how we think. They are our most intimate tools, the ones we use for self-expression, for shaping personal and public identity, and for cultivating relationship with others” (p. 45). The argument of the publication’s power has existed since the invention of the printing press … what are we going to publish and with whose voice? Who is being left out of publishing and at what cost to society? It’s possible to question this same problem of equity if we admit that “reading and writing are unnatural acts” (Carr, 2011, p. 51) and are shaped by parents, environments and school. My concern is that in public education in a G8 country, that we need to try to level that playing field so that every student has an equal opportunity to learn. I read a lot of news and magazine articles from my iPad which I control the flow of information using an app called Zite. It allows me to turn on or turn off subjects of my interest and filters in my favourite writers, and filters out writers who I deem unworthy of my attention. I love that every time I connect that there is a magazine filled with articles just for me. Yet I’m turning into one of those people at parties who can’t talk about anything other than books, school libraries, chiweenies and the humble kitchen garden. I read a lot but what I read doesn’t represent my renaissance upbringing. It represents what Amazon has recommended for me based on my past choices, or what my filters have chosen for me in Zite. However I don’t think that I’m reading any less deeply. I’m able to make big leaps in my intellectual logic, because I’m able to make room in my brain for bigger ideas than the quick facts that I can Google. In contrast to Carr’s premise, Jim Collins (2013), Department Chair at the University of Iowa, argues that in order to get past “the debate between the defenders of traditional literary experience and the celebrants of digital culture…we need to distinguish between a delivery system and a medium.” I’m still choosing to read a breadth of material on deep topics, but my reading has definitely changed in that I’m able to now metatag and share my reading with others in a way that I never have before. Collins (2013) also argues that “Reading literary fiction on an e-reader is not a gateway drug that leads to the hard stuff of digital culture — become psychologically dependent on that e-reader, and you’ll find yourself in an alley somewhere with a cell-phone novel written by promiscuous Japanese teenagers sticking out of your arm.” Although I may be juggling a lot of new information (Carr, 2011, p. 139), I’m also making connections in new and interesting ways. Instead of tapping into a culture of fear about the internet’s potential for corruption, we should be using it to further our culture of reading into something more participatory. Although Carr wrote The Shallows in 2011, his vision of libraries (p. 98) doesn’t represent my reality in 2014. In 1994, the main floor of my library was converted to an open computer lab that could accommodate two classes at once and the books were relegated to a new lower level. We’ve just made a major overhaul in moving the desktops out, the books back upstairs and doubling our computers by using cheaper, lighter mobile devices. The emphasis isn’t on computers or books…it’s on learning. Which makes me question once again Carr’s opinions on how schools should scaffold the use of technology? I am more concerned that students in my community are missing out on technological advances, than if they’re indulging in technology for self-gratification. Where is Carr’s research on the digital divide? Does Carr believe as the United Nations does that access to the internet is now a fundamental human right? (Jackson, 2011). While Carr has some valid arguments, especially those steeped in the rich history of language that he outlines in detail, I don’t want to believe him. I want to believe that we are in a cultural infancy and that while we may be sacrificing some skills, that new ones will emerge. Someday I believe that society will use the power of the global internet to solve the world’s problems rather than spending it playing Candy Crush Saga…unless each candy crushed will somehow eliminate poverty and hunger. Collins, J. (2013). Reading, in a digital archive of one’s own. Publications of the Modern Language Association, 128(1). I submitted this paper today in fulfillment of the requirements for my M.Ed. I always felt most comfortable working with students in portfolio courses where students knew what they needed to accomplish and had ample opportunity to do and re-do their assignments until they were satisfied. I came into being a full-time teacher-librarian after being perfectly autonomous in my isolated department silo of English, drama, or media arts. Teaching in the arts subject areas naturally leaned towards project-based learning as I had open level classes; ones that weren’t streamed. The portfolios and the projects were about achieving a personal best. The class atmosphere was comfortable and collaborative, not competitive. Sometimes we wore hats, or listened to music, and often students did their brainstorming sprawled on the floor. Learning was always happening as we travelled together through the creative process. When the opportunity came for me to move into the library I was nervous, but I knew that the diversity of roles that I would play there would engage me forever. I thought the library was a utopia for freedom of thought and resources to stimulate and encourage curiosity and imagination. I was surprised to find that the library culture was territorial and competitive. Access to resources was controlled, availability of technology and librarian support were limited and equity was a constant struggle. Teachers strategized against each other for space, computers and my time and expertise in areas in which I did not yet feel confident. Students felt split between their opportunity to study and the distractions around them. It has taken me 5 years to get the library space and culture to a place where there is no need for ‘shushing’. We still experience the feelings of scarcity with resources, but generally the new learning commons is a place where learning happens and we celebrate student success. In many ways this paper on transliteracy is about my journey in understanding the complexities of technology integration in schools and my battles to keep these ideas foremost apparent in my learning commons: access, availability, and equity. One day I noticed a student using my old-fashioned lab, facing a wall and elbow-to-elbow with strangers on either side, waiting for his group members to begin collaborative work on his computer. He pulled out his iPad to read his notes from, and his phone to text his classmates asking them when they would arrive. To be doubly sure they were on their way, he opened up Facebook on his screen and messaged all of them inside their group space. His substitute teacher came over and told him to stop playing with his phone and using Facebook and to get to work. The substitute teacher believed that the student was being unproductive. Within a week, a science teacher asked for help with his struggling Grade 10 students who were researching elements of the periodic table for their properties and how the elements are used in everyday life. I had them sit with me and discuss what they already knew about their elements, and to reiterate the assignment. We went to our science database and I showed them how to read and navigate the page and the students began their hunt. Their teacher was amazed that they were so cooperative and enthusiastic about doing online research. I feel that their teacher actually believed that these students weren’t up to the challenge. A contemporary vision of transliteracy, originally defined by Thomas, Joseph, Laccetti, Mason, Mills, Perril and Pullinger (2007) as: “the ability to read, write and interact across a range of platforms, tools and media from signing and orality through handwriting, print, TV, radio and film, to digital social networks,” (para. 2) demands individualization. Technology allows every teacher to provide students with equal opportunities to learn. Just like the librarian who keeps all the books under lock and key, practices that don’t engage students with their own curiosities are becoming increasingly antiquated. Although the amount of time and assistance may differ between students, every teacher in every school should provide the same opportunity to learn to each student. In my experience, the best way to support transliteracy is to provide equal opportunities for everyone to learn and to level the playing field so that we can progress together. There is a race happening to keep up with the latest trends in educational technology. As I watched my school computer committee decide our implementation for the next 3 years, I feared that they would side with whatever was easier to manage. I hoped they would listen to the individual requests of each department for devices that would best suit their subject area. I insisted that the new learning commons model the diversity of learning styles that exist in our student population. My arguments were ignored. The committee chose to invest in 270 Samsung Chromebooks. Their choice to spend our allotment on the same device reinforces the message that all students learn the same. This doesn’t reflect a teacher or student’s individuality in choosing the right tool for the right job. This choice doesn’t put pedagogy or learning first. There are pitfalls in this urgent approach to integration including only exposing our students to a surface level of technological exposure which won’t allow them to fully understand the social, economic and environmental implications of our impulses. I have struggled to feel comfortable with the nomenclature of this elusive skill set for students and in the last 5 years I have moved from calling them literacy skills to digital fluency to 21st Century learning and am finally resting on transliteracy. It seems that even now in the year 2014, when teachers are very familiar with the term 21st century learning, that we rely on traditional models of teaching and management which ask students to fit the same mold. I believe that this model of standardized teaching continues to benefit the same students who have always done well. Teachers are having a hard time wrestling with the new complexities of user/reader, software/hardware (King, 2012) and have too long been under the impression that students now are inherently more capable on computers since these students were born in the age of the internet. It seems that teachers are struggling to change their teaching and be comfortable with ongoing change. Meanwhile students appear to be challenged to engage deeply with material and persist when faced with problems they can’t quickly solve. The education system itself seems uncertain with how to proceed. Using the term transliteracy sets the goal in education to aim towards having literacy skills transfer across modes and mediums, and that these skills will adapt with every new change in software or hardware, mode and medium. I hope that the skills of creation, collaboration, communication and curation will be strong no matter what changes come. There are some who see technology as a new set of skills to be developed separately from curriculum content, and others who see it as integrated into every classroom. Certainly the education system could do more to support professional development during this renaissance. In my own experience, the best professional development offered to me outside of my school district continues to be self-driven. I am receiving increasingly enticing offers to become a Google Certified Teacher or to become a Mac Educator. At the same time there are hidden pitfalls to allowing Google and Apple to fill holes in professional development that aren’t being offered elsewhere. Allowing professional development to be steered by corporations, ensures that a business model emphasizing the product will be implemented rather than a pedagogical approach which benefits learning. A model of technology integration in my board that has potential to support pedagogy is the BYOD program . The BYOD (Bring Your Own Device) program offers face-to-face and online workshops for teachers to join over the course of 6 weeks. Teachers who commit to the program receive a Google Chromebook and time with coaches to feel more comfortable. The program teaches skills while coaches model a philosophy of embracing a diversity of devices in the classroom. The Ontario School Library Association (OSLA) has recognized and responded to the changes required to meet the transliteracy needs of staff and students in their new Together for Learning document (Ontario School Library Association, 2010). The document introduces Ontario teacher-librarians to The Learning Commons model which emphasizes the development of physical and virtual spaces where learning can happen 24/7 in multiple modes. Together for Learning reinforces the necessity of Learning Commons spaces to be staffed by professional teacher-librarians who can best support staff as they redefine curriculum to encompass transliteracy. The Learning Commons puts emphasis on the pedagogy of educational technology. I want to develop a clear model of pedagogy to support the development of transliteracy in staff and students. Ideally, this model would be sustainable, like a pyramid, with one level learning from the next and continually paying forward their learning. As an agent of change in my position, I have seen the pyramid have a lasting effect on our school’s adoption of technology integration. The desire to integrate technology equitably and sustainably pushes me to ask: How can teacher-librarians support students and staff in developing essential transliteracy skills? What is their value or importance? What is the role of role of teacher-librarians in supporting students and staff in developing essential transliteracy skills? How can teacher-librarians support students and staff in developing essential transliteracy skills? The term transliteracy has evolved from recognizing that the same offline skill set does not necessarily apply to online communication. Coiro (2012), a researcher in adolescent online reading comprehension development, points out that “some of these additional, or new, reading strategies include generating digital queries, scrutinizing search engine results and negotiating multiple representations of text” (p. 551). The term transliteracy has evolved from multiple attempts by researchers to consolidate the skill set that learners require to work fully in multiple modes. Transliteracy then becomes a skill set that also utilizes metacognitive understanding of one’s own learning patterns, allowing the user/reader to adapt to changing texts and platforms. What is value or importance of transliteracy skills? In public education it is essential that we give each student the same exposure and opportunity to interact with new modes of learning. Livingstone (2012) warns while exposure to online reading generally improves school achievement, that the “already high-achieving children get more from gaining internet access than do low-achieving children” (p. 15). In order to bridge this gap caused by detrimental factors external to a teacher’s influence, Dobler (2007) suggests “Teaching students how to learn, rather than what to learn, gives them the flexibility to adapt to changes in both text and technology” (p. 95.) Focusing on transliteracy should allow students to meet future challenges with confidence, no matter the mode or medium of delivery. Many researchers allude to the necessity of teaching attitudes and skills in information literacy and lifelong learning to our students as they become leaders in the global community (Bruce et al, 2012; Crockett, Jukes & Churches, 2011). Crockett, Jukes and Churches (2011) agree that “we need to shift our instructional approach to a 21st-century learning environment that will provide our students with the most in-demand skills: those that can’t be easily outsourced, automated or turned into software” (p. 11). Specifically, researchers group these skills into improving capacity for transdisciplinary communication, collaboration, and knowledge and information practices (Bruce et al, 2012; Crockett, Jukes & Churches, 2011). With all of the active links, sidebars and flash animations on more web pages, it has lead many researchers to question how deeply readers are engaging with texts. Carr (2008), popular technology and culture writer, says that reading online has changed our behaviour: “Our ability to interpret text, to make the rich mental connections that form when we read deeply and without distraction, remains largely disengaged” (para. 8). However, others are questioning if this is not a cultural change that will improve with experience. Collins (2013) questions the idea that technology is influencing reading negatively: “Carr and Shirky define[s] literary reading solely in technological terms, and neither demonstrates much interest in how reading technologies are embedded in cultural formations” (p. 210). Collins maintains that since reading technologies, regardless of their mode and medium of delivery, are products of culture, therefore the culture will adapt to new technologies. If Collins is correct, then educators have a hope of making reading engagement possible as long as we keep culturally redefining the idea of text and reading through the development of transliteracy skills. As with the redefinition of texts and reading with the advance of digital formats, so too is the redefinition of the idea of community. Community has not devalued with the integration of technology, but it is changing as communities are built online. Bruce et al. (2012) argue that citizenship now encompasses online communities built on the user’s interaction with education, fantasy, information, relationships and transactions (p. 532). In being a good citizen, many of these online communities have offline impact on art, heritage, archives, and education (pp. 533-544). As libraries shift their definition of information literacy to include digital citizenship, they may play a key role in developing communities online as well as offline. What strategies or practices or programs have been found to be supportive of transliteracy skills? Researchers have been asking this same question about best practice in technology integration for some time. Bruce et al. (2012) wonders what does transliteracy “look like across contexts, national borders, complex organizations and community subcultures, including the innovative cultures emerging in digital landscapes” (p. 524). Indeed the task of trying to isolate the transliteracy skills and concepts that have such universal application is challenging. Fullan (2013) insists that there are “four criteria for integrating technology and pedagogy to produce exciting, innovative learning experiences for all students…these new developments must be i) irresistibly engaging (for students and teachers); ii) elegantly efficient and easy to use; iii) technologically ubiquitous 24/7; and iv) steeped in real-life problem solving” (p. 4). These goals are high and yet we know in order for transliteracy to take hold that we must have grounded suggestions for success in schools. As Thompson and Mishra have outlined here, incorporating a model of pedagogy like TPACK, would lead to a deeper understanding of transliteracy skills and concepts. Because of the variables that digital technology integration brings to teaching, teaching with digital technology can be much more complex than teaching with traditional technologies. Michael Fullan (2013) says: “[Technology] is being grossly underutilized pedagogically” (p. 40). In order to allow the technology to be integrated with pedagogy, it helps to incorporate the broadest scope of technology’s reach into learning structures that a) individualize learning and b) emphasize the process of learning. It seems that inquiry-based learning structures do this as students work through recognizing a problem or question for further exploration, visualizing a solution, researching the best strategies, and then presenting solutions. Reflection is also a stage that is essential to many different phases of this process. At the very least, TPACK seems to allow all the stakeholders in education to have a common vocabulary as they aim to achieve high standards both in technology integration and pedagogy (Brantley-Dias & Ertmer, 2013). One of the model’s strengths is that it is not specific to a particular discipline, so it allows whole systems of education to develop goals (Brantley-Dias & Ertmer, 2013, p. 119). However, TPACK has been criticized for its simplicity and lack of best practice strategies for implementation. It may describe the ‘why’ we need a continuum, but it doesn’t suggest the ‘how’. The SAMR model of technology integration (Figure 2), developed by Dr. Ruben Puentedura (2006), may offer more pedagogical strategies. There is a growing movement away from using the phrase technology integration as it seems to emphasize technology for its own sake. Instead, some researchers are arguing that the phrase technology-enabled learning would help put the focus back on the student (Brantley-Dias & Erner, 2013, p. 120). 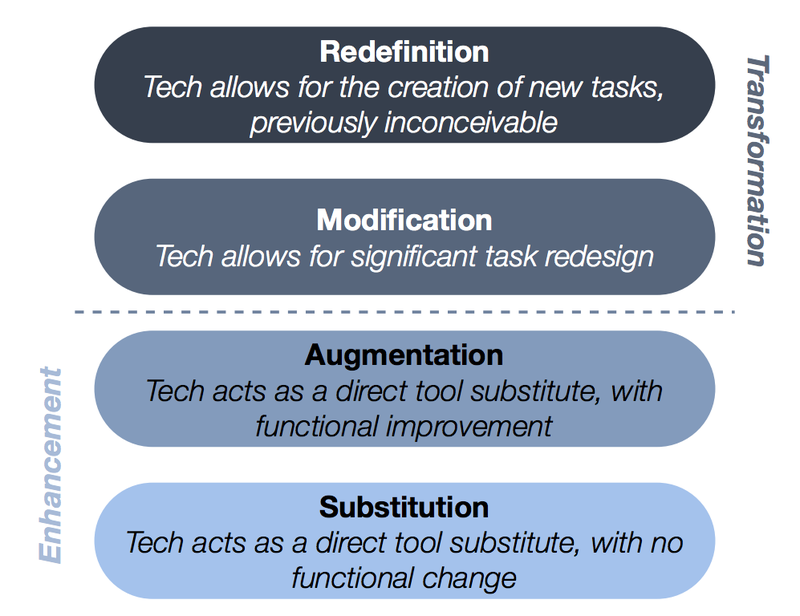 The SAMR model asks teachers to move from using technology to enhance teaching, to using technology to transform teaching. Awareness: Information scanning, exploring and sharing, within formal education and research environments, through using innovative technologies and traditional strategies. Process: Engaging with information processes to learn through, for example, inquiry, problem, or resource-based learning and research. Control: Organizing information, making and managing connections between information and learning needs, for all types of assignments and research projects, both independent and collaborative. Knowledge Construction: Developing personal understandings of knowledge domains through critical and creative thinking processes. Knowledge Extension: Creating and communicating new knowledge within and between discipline(s), innovating and creating new insights and new solutions to problems as outcomes of learning activities, including assessment and research projects. Wisdom: Using information wisely and ethically on behalf of others, applying knowledge developed through learning and assessment activities or research projects to further social, economic, and educational well-being. With the right support, it may be possible to reach every student and to maximize their learning potential in every classroom activity. This will allow every student to have exposure and potential mastery of transliteracy skills and concepts. In order for transliteracy to become pervasive “it is essential to provide present and potential participants with a supportive environment, built upon understanding and enhancing information and learning processes; and to introduce opportunities for the uptake and adoption of new practices [which] include [making use of] library administrators” (Bruce et al., 2012, p. 534) Depending on the context of the learning, adding additional support may mean changing the physical or virtual spaces; increasing access and availability to learning; and increasing opportunities for teachers to build their own transliteracy skills. Michael Fullan (2013), professor of education at the University of Toronto, states that “Innovative teaching practices were more likely to be seen in schools where teachers collaborate in a focused way on the particular instructional practices linked explicitly to 21st century learning skills” (p. 43). Furthermore, Fullan argues that the best kind of professional development is one where teachers are actively engaged in research of their own creation and management (p. 43). In order for teachers to raise the stakes on the significance of transliteracy, they must be allowed to engage with assessing and improving their own teaching of transliteracy. What is the role of teacher-librarians in supporting students and staff in developing essential transliteracy skills? A traditional role of librarians might be to provide accessibility and usability to their patrons. As lines have blurred between modes and mediums of literacy, so too are the lines blurring between libraries and other civic centres like museums and galleries (Bruce et al., 2012, p. 535). Bruce and co-authors (2012) argue that learning activities in school libraries need to focus on four types of learning: 1) reflective learning which promotes inquiry, reflection and problem solving; 2) management of information resources; 3) self-directed learning individually and collaboratively; and 4) research-based learning (p. 536). Adapting to these learning activities may require a significant redesign of program and space in school libraries. As transliteracy becomes a vital expectation of schools, so too will the role of teacher-librarian as a community link to providing resources, facilities and programming to support transliteracy. In serving a role as the hub of any learning community, a teacher-librarian must prioritize recognizing and overcoming any barriers to the sustainability of the library’s mandates. These barriers often prevent transliteracy from being mastered. Fullan’s research in Ontario (2013) describes the problem as “The organizational support for the use of technology in schools is badly underdeveloped (availability of digital media, shared vision, school culture, technical support, leadership and the school, district and state levels, assessment systems, and so on)” (p. 37). In addition, one of the common programs of school-libraries has been information literacy instruction “while not always extending attention to helping students engage with content through their information use processes; and insufficient attention has been given to understanding and supporting the experience of engaging with information in workplace or community contexts” (Bruce et al., 2012, p. 523). The teacher-librarian’s role in supporting transliteracy includes recognizing barriers to support, engagement and consistency and pressing for greater access and availability of resources. Although the learner community may be extremely diverse, the teacher-librarian needs to develop resources and programs to support the context of the school community. Bruce et al. (2012) advocates that “the real life experiences of the population to be served should inform planning decisions; what using information to learn (being information literate) means to them, in the present situation, must become the starting point for the conversation. If it becomes clear that changing (or enhancing) peoples’ ways of being information literate requires new educational, training or change management processes, this must occur through inclusive participative planning processes” (p. 535). Once these needs are identified, programs and resources to support the development of transliteracy can be obtained with the knowledge that the teacher-librarian is best serving the community. In some circumstances, the teacher-librarian may discover that the school community’s resources are scarce and that transliteracy has been undersupported to the detriment of transliteracy development. In such cases, the teacher-librarian needs to remediate the adults and managers of the community that are lacking transliteracy skills, such as parents, teachers and administrators. Coiro (2012) has much to say on the topic of beginning remediation “of meeting teachers where they are” (p. 553). As many teachers are new users of transliteracy themselves, in order to be able to teach these skills they will require the scope of support available to meet teachers where they are comfortable. “Classroom teachers bring a range of abilities, assumption, and comfort zones with them into any professional development situation, and they need time to express their ideas and concerns in a way that explicitly shapes the direction and pace of their learning” (Coiro, 2012, p. 553). Henderson (2013), an Ontario technology integration teacher, says “It’s okay to be where you are, it’s just not okay to stay there.” Coiro suggests that short sessions of technology exploration that are job-embedded and risk-free are a great place to encourage developing professional networks (p. 553). Eventually these interactions can progress to global connections and the creation of new communities. In experiencing first-hand the power of digital connections “teachers also learn how to become mediators, supporting students’ self-reflection and self-regulation in ways that enable adolescents to gain greater control over their own literacy practices with networked information technologies” (Coiro, 2012, p. 553). Embracing some transliteracy first as learners allows teachers to confidently tackle teaching transliteracy skills themselves and moving forward with their students. When I was first introduced to using technology in my classroom it was in the form of developing a classroom website and using an interactive whiteboard. I quickly learned that my students needed to be explicitly taught technology strategies through my class content in order for the students to find it meaningful. Likewise, transliteracy models challenge every learning experience to be authentic and to be a true measure of deep understanding of concepts. For too long, the education system has underthought the pedagogy of implementing technology in education. Dynamic developments in technology should be revolutionizing teaching, but have instead only maintained our factory model standards of achievement. As a result, we have serious deficits in transliteracy that need to be addressed. I have had the benefit of using my position as teacher-librarian to influence the entire school community in developing a mindset that is more encompassing of multiple literacy modes and mediums. My next step after this research is to help the staff and students to develop transliteracy skills in relation to the curriculum. The TPACK model is taking hold of my teaching and I am able to model it in collaboration with my staff. A common lesson I’ve been using is in our Grade 10 Careers classes during their job shadow assignment. Typically the students have taken a day to shadow someone’s job and then used a presentation software to report about it to the class. 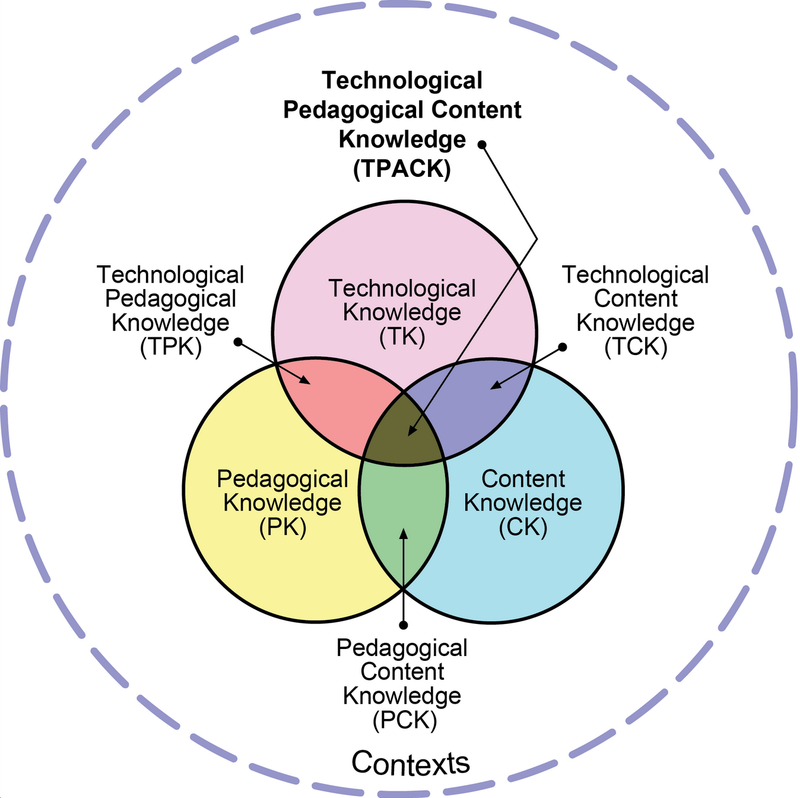 Inserting the TPACK model my goal is to bring the pedagogy and technology closer to enhancing the knowledge of that experience. I show them cloud-based computing software, like Prezi or Google presentations, and we use the tool for planning before the job shadow experience. I incorporate elements of design, photography, and encourage the classes to find visual ways to describe their experiences. Although many of them can rely on internet images and videos to embed, I also encourage them to use their phones or cameras to capture real pictures and videos of their day. Having the opportunity to use the class content, finesse the assignment and use the technology more fully to its potential of all stages of this individualized experience, makes the job shadow experience and the sharing more impactful. The SAMR model is more challenging to incorporate as a teacher-librarian as it requires true collaboration as I help the teachers tweak their assignments to maximize the potential of the learning experience with technology integration. An example of this is when I suggested using social media to build community for the student attendees of our annual mental health conference. Traditionally, we invited speakers to come and answer questions with our students. Once I created a Twitter hashtag for the event, students and the greater community became connected in a meaningful way by using the hashtag to crowdsource questions and ideas in response to the messages of the day. To further enhance the power of the social media, we used a second screen to project the feed from the Twitter hashtag which allowed everyone in the room to be included in the conversation not just those with phones. In this way, we moved to actually redefine the learning experience of the day by using social media to create community, before, during and well after the event itself. It was simple for the organizers to archive the day and learn from the Twitter stream in their planning for future events. Teacher-librarians are in ideal positions to be the agents of change in schools in full integration of transliteracy models. They can use their unique perspectives to see opportunities for building cross-curricular collaboration for problem-solving. Teacher-librarians can model teamwork and risk-taking to the entire school community as they facilitate experimentation that suits the passions of individual student needs. 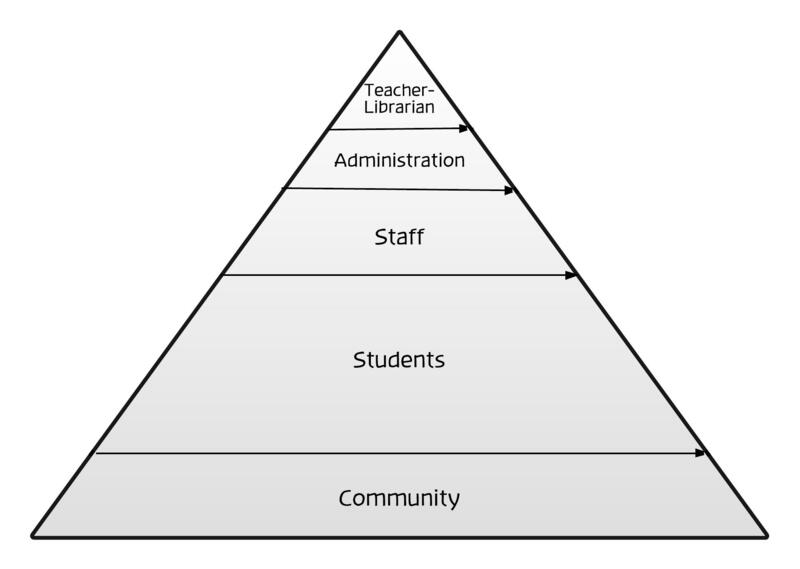 As such, teacher-librarians become the top of the transliteracy integration pyramid (Figure 3). Through their work and example, integration will flow downwards to impact the entire school community. Likewise, the entire school community will flow upwards to drive the purpose of the teacher-librarian position. Born out of my own frustrations and anxiety about obvious disparities in my school in terms of technology integration, I began this paper asking the question: How can teacher-librarians support students and staff in developing essential transliteracy skills? With the help of the masters before me who advocate for a curriculum where students develop a skill set of tools for perceiving and creating texts in multiple modes and mediums, I am prepared to move forward in my own role as a teacher-librarian. Achterman, D. (2010). Literacy leadership and the school library. In S. Coatney (Ed. ), The many faces of school library leadership (pp. 67-84). Santa Barbara, CA: Libraries Unlimited. Berger, P. (2007). Literacy and learning in a digital world. In S. Hughes-Hassell & V. Harada (Eds. ), School reform and the school library media specialist (pp. 111-127). Westport, CT: Libraries Unlimited. Brantley-Dias, L., & Ertmer, P. A. (2013-14). Goldilocks and TPACK: Is the construct “just right?” Journal of Research on Technology in Education, 46(2), 103-128. Bruce, C., Hughes, H., & Somerville, M. M. (2012). Supporting informed learners in the twenty-first century. Library Trends, (Winter). Crockett, L., Jukes, I., & Churches, A. (2011). Literacy is not enough: 21st-century fluencies for the digital age. 21st Century Fluency Project. Dobler, E. (2007). Reading the web: The merging of literacy and technology. In S. Hughes-Hassell & V. Harada (Eds. ), School reform and the school library media specialist (pp. 93-110). Westport, CT: Libraries Unlimited. Fullan, M. (2013). Stratosphere: Integrating technology, pedagogy and change knowledge. Toronto, Canada: Pearson. Hales, S. (2010). ‘It’s incumbent upon librarians to give us something more’: An interview with Nicholas Carr. Information Outlook, 14(3), 28-30. Henderson, L. (2013, October). It’s ok to be where you are, it’s just not ok to stay there. Poster session presented at Educational Computing Organization of Ontario, Niagara Falls, Canada. King, A. (2013). Redefining reading and the role of the teacher-librarian in the age of online text. Journal of the Literacy Special Interest Group of ISTE, 1(1), 23-29. Livingstone, S. (2012). Critical reflections on the benefits of ICT in education. Oxford Review of Education, 38(1), 9-24. Ontario School Library Association. (2010). Together for learning: School libraries and the emergence of the learning commons [Pamphlet]. Ontario Library Association. Puentedura, R. (2006, August). Transformation, technology and education. Paper presented at Strengthening Your District Through Technology. Andrew Churches has been one of my professional development gurus ever since he developed the Bloom’s Digital Taxonomy https://edorigami.wikispaces.com/Bloo… . This is my first encounter with the other two authors and I think they’ve….watered down the richness of the content with professional development activities. I would have preferred more of the ‘how’ are we going to move up the taxonomy with technology implementation than more ‘why’. I’m already convinced. You were preaching to the choir. For those of you who haven’t found out about the Pecha Kucha style of presentation, there’s already another kid on the block. It’s even faster than Pecha Kucha with 20 slides at 15 seconds each. I found it really difficult to do asynchronously but that’s what my professor wanted so I tried. Make a mini-presentation with just a few slides and a clear topic for each slide. Make a full IGNITE presentation on your upcoming essay topic. Write a 3000 word essay. I’m still working on the essay but I knew a week ago how I would organize it based on the work I needed to do for the IGNITE presentation. I can think of a whole bunch of ways that I can adapt the same scaffolded strategies to levelling up in digital literacy, building content knowledge and writing/research skills. Here’s the inaugural issue of the new ISTE SIG LIT Journal, Literacy Special Interest JOURNAL and a reprint of my original paper.